Quite nice. Quite nice indeed. And simple. Does anyone remember the “find” I made at the grocery store a few days ago? The lamb rack? 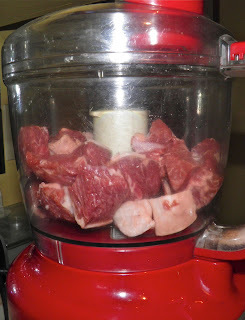 food processor. Pulse and you're done. I used to be the king of one-pot. It has many advantages, besides the obvious one of fewer dishes. One-pot usually means whatever you make is, in my mind, more of an infusion of flavours, as opposed to different items arranged on your plate. I like one-pot meals – stews, braises, you name it... They’re my friend. I make a Palestinian dish with chicken that is amazing called Maqloobeh. It’s really easy and quite impressive. The recipe is here. Since I had the lamb I thought I would give it a try. In a Greek way this time. Whenever you’re faking/making dishes reminiscent of different cultures you have to be aware of some of the “staples” that are signature flavours. It’s simple enough if you spend any time either in the kitchen or in ethnic restaurants. For Greek food some of the familiar culprits are lamb, eggplant, tomatoes, feta, oregano and nutmeg. Of course there are many more, but those are the ones I chose. This was really tasty, and I would make it again in a heartbeat. 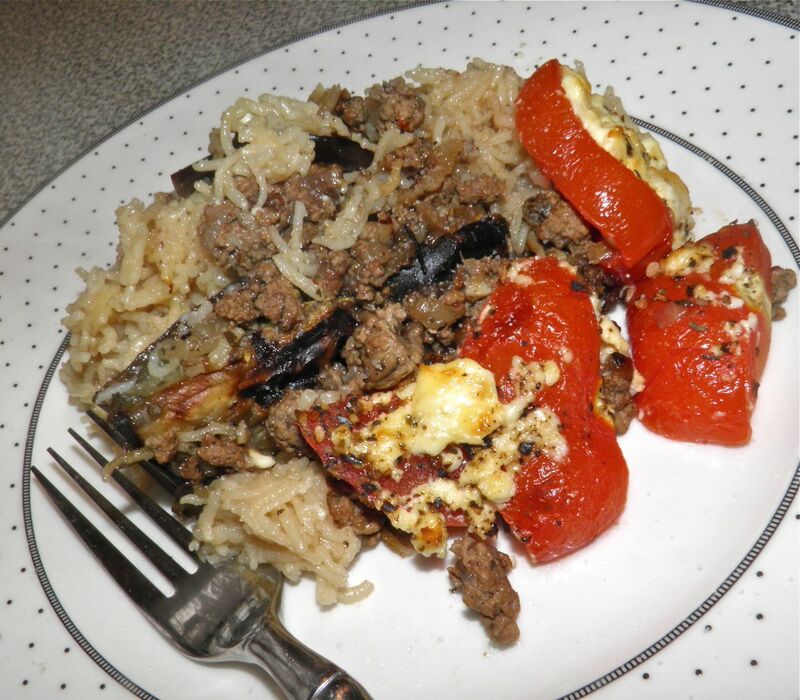 My husband said it tasted like something you would get in a Greek country kitchen. Success!! It may also seem like there’s a lot of oregano and nutmeg, but it all balances out. Trust me. While I’m on the subject of nutmeg, buy whole nutmegs and grate your own. You can get them at the bulk food store and they keep forever. I’ve had a bag that I’ve been slowly going through for years. Just grab a nut and grate. It tastes so much better than buying previously ground. That holds true for any spice. As soon as it’s ground it starts to lose flavour and strength. Buy yourself a small grater and a coffee grinder for exclusive spice use. They’re kitchen essentials. Cut the eggplant in half, rub the surface with half of the oilive oil and sprinkle with salt. Broil on a baking sheet until the top is well browned. Set aside. Turn the oven heat from broil to 350°F. 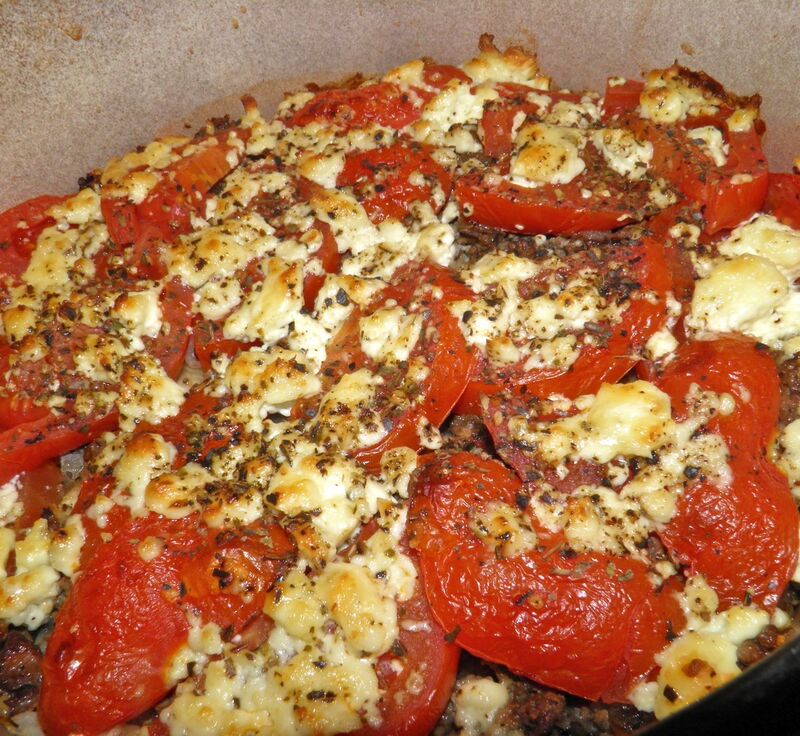 Heat the remaining oil in a Dutch oven or other large oven-proof pot with a lid. Sauté the lamb until no longer pink. Season with the oregano, nutmeg, salt and pepper, remove to a bowl. Cut the eggplant into chunks and arrange on the bottom of the pot. Then add the rice and water. 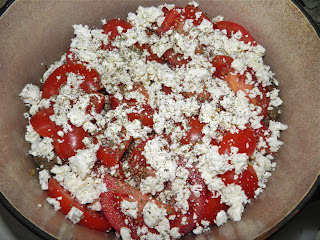 Layer with the lamb and then the tomatoes. Season the tomatoes with a little salt. 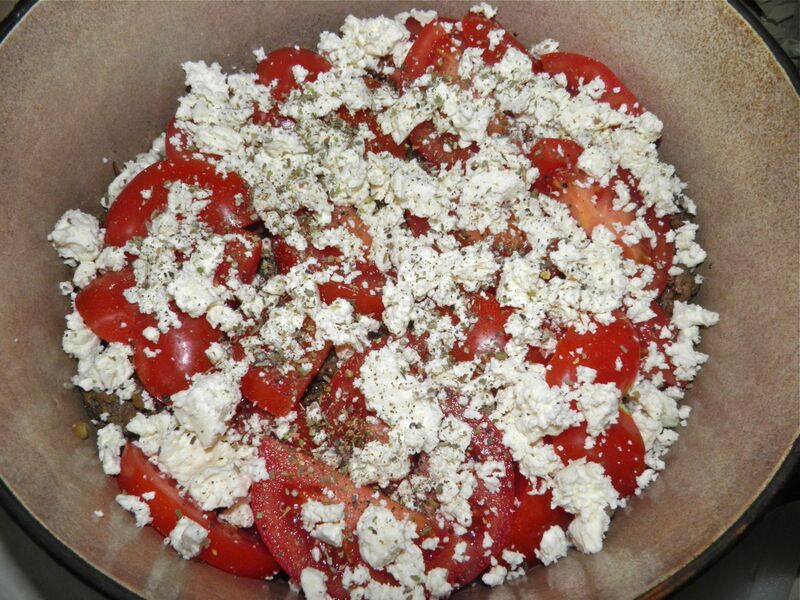 Then top with the crumbled feta cheese. Sprinkle with more pepper and oregano if desired. Cover and bake for 40-50 minute, until the rice absorbs the water. Remove the cover, turn the oven to broil and cook for an additional 5 minutes. This will brown the top of the cheese.